Mother’s Day is creeping up on us isn’t it?! I’m having a hard time processing the fact that last Mother’s Day I was in the hospital with my newborn baby and now she’ll be turning one!! That’ll be a hard year to top but I’m looking forward to all the celebrations this time around. Anyway, I’ve put together some of my picks for Mother’s Day gifts for your own mother or to pass on to your husband/children as a not so subtle hint ;) I love this selection because all of the items are practical but at the same time something that many mothers may not splurge on (ie matching pj’s – because mine never match – , pretty flip-flops, a set of hymn cards, a fun turkish beach towel, an updated phone case or a sentimental necklace to name a few). Hopefully you can find that something special to bring a smile to her face! I hope you guys had a great weekend! We had the most beautiful weather around here. My husband and I spent most of our time doing some spring clean-up in our yard and I ended up with some less than desirable tan lines, oops. But on to the dress…this dress has been blowing up on my Instagram feed and I can see why. It comes in ivory or coral (as seen here) and is so simple and versatile. I’ve already worn it a couple of different ways and have more ideas in mind (think various heels/wedges, denim jackets, scarves, hats etc.). I’m also in love with the midi length. Not too long, not too short, but perfectly lady-like :) And at a great price point, it’s hard to pass up! I hate to rush the matter, but swimsuit season is creeping up on us, ladies! As much as I’ve been thrilled with the assortment of beautiful dresses lately, I have to say I am slightly underwhelmed at the selection of swimsuits. Or maybe I’m not thrilled about hunting one down? I’m not saying there aren’t any good finds however, I did a lot of scrolling and narrowed down my favorites for you here. You will see my picks of one-pieces, bikini’s as well as cover-ups. How about you guys, have you begun searching yet? Find any good ones? Hi all! Sorry for my blogging delay this week. Wedding festivities and sick children over the weekend had everything else on the back burner for a bit. My sister’s wedding was absolutely beautiful. She was stunning and there was so much love bursting that it was almost overwhelming. I’m just so darn happy for her and her new husband! And to top it off the weather was absolutely gorgeous…70+ and sunny compared to last weekend where we woke up to snow on the ground. We totally lucked out! My kids on the other hand hung in there, but the girls were battling ear infections and a nasty virus that my little one is still trying to overcome. They kept me on my feet to say the least ;) Thankfully we had family all around to help out! This top is rather new yet it’s already in heavy rotation over here. 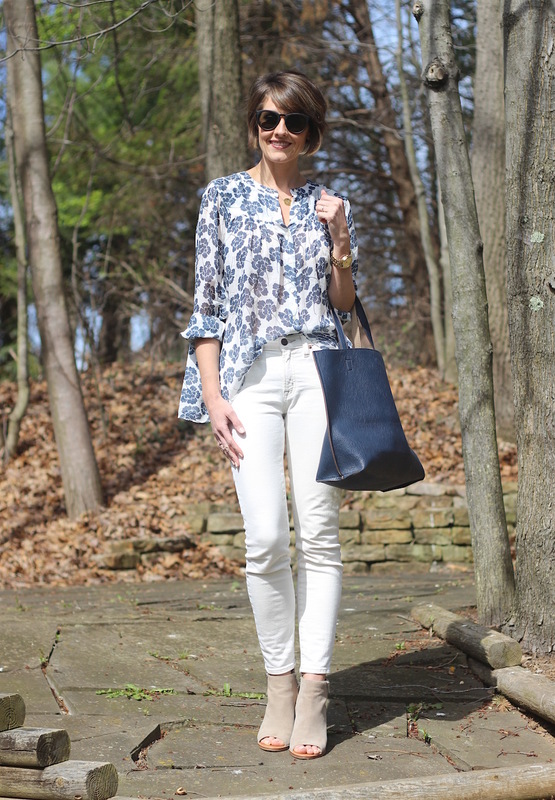 It’s feminine, light and airy which lends to an easy, comfortable outfit. 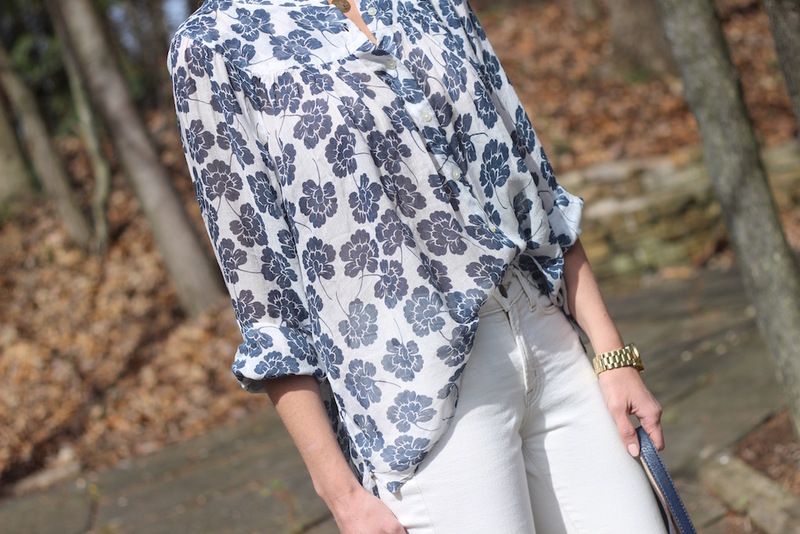 Perfect for the warmer temps that I hope will be sticking around! 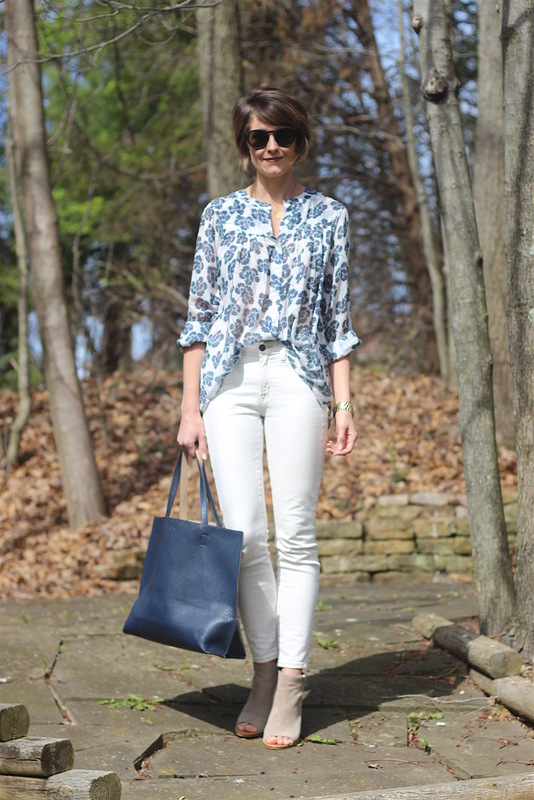 This is a perfect spring outfit for me. I love the trendy lace-up top in the form of a comfortable, light sweatshirt. It’ll be perfect to throw on over cut-off shorts on summer evenings and could even be dressed up with some cute trousers. These jeans are a recent purchase that had been sitting in my cart for far too long. I love the relaxed frayed hem, the wash and the perfect amount of stretch that they have. One of my new go-to’s for sure! I don’t know what it is this year, but I’ve been so drawn to dresses lately. I’m never one to turn away from a pretty dress, I just wish I had more opportunities to wear them! Since so many have been catching my eye lately, I figured I may as well share some with you so maybe just maybe they can all get a little love :) Oh and let me just mention that all of these happen to be under $80, not too shabby! From an afternoon picnic to a summer wedding, I covered all the bases. What’s your favorite?? Over the past few years I have casually been hunting for a great trench coat. I know it doesn’t seem all that difficult of a task being that there are endless options available, but for some reason I couldn’t commit. I knew I wanted classic and timeless but with some sort of flare. I loved the mossy green shade of this one which works better on me than the traditional khaki color, and the gold asymmetrical zipper added the perfect detail that I was looking for. Not surprisingly, this one sold out quickly, but various sizes keep popping back in stock, so you might want to keep checking back! I found a few similar options that you can see here and here. I also recently ordered this t-shirt after seeing it on a few Instagram accounts I follow and it’s just as great as I hoped it would be. 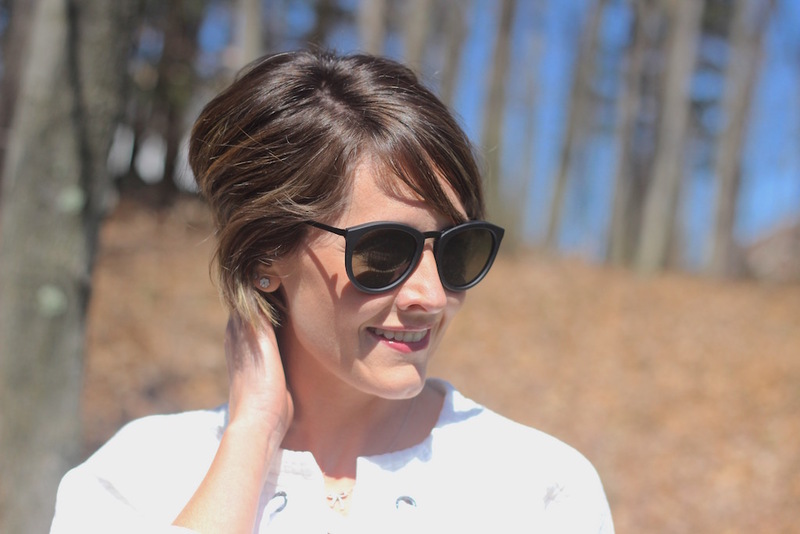 It has a loose, draped fit and comes in a handful of colors that I now want more of! A couple of years back I had actually posted a trifle similar to this one, but I had more recently come across another version that I was tempted to try. This past week we hosted a luncheon for teacher appreciation week at my son’s school. I signed up for angel food cake and berries with the intention of making this thing. My suspicions were right about this particular recipe, it was fantastic! In between the fresh berries and fluffy angel food cake is a layer of cream cheese frosting and a drizzle of lemon syrup. Yum, yum! 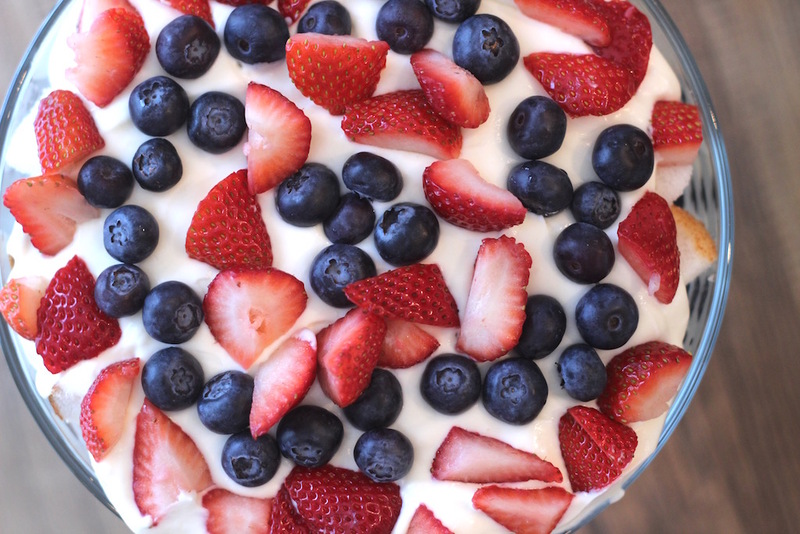 It may be an obvious summer dessert, but would also be great to serve if you are hosting any showers, luncheons, birthdays, Mother’s Day gatherings, etc. in the upcoming months. Note: This cake is best served the same day it’s made. Refrigerate until ready to eat. In a measuring cup, combine ¼ cup water, 2 Tbsp sugar and 2 Tbsp lemon juice and stir until sugar is dissolved. Set aside until needed. Beat together 1 lb cream cheese and ¾ cup sugar (with the whisk attachment) on medium speed until creamy and smooth, scraping the bowl a couple times. With mixer on, pour in 2 cups heavy cream then turn mixer to medium/high and continue beating until consistency of whipped cream. Add ½ tsp vanilla and beat until incorporated. 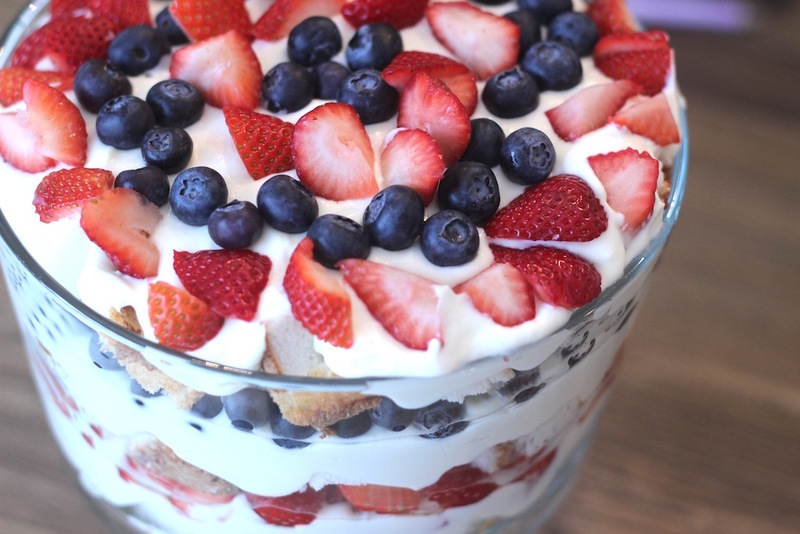 Place ⅓ of your sliced angel food cake into the bottom of your trifle dish and brush with ⅓ of your syrup. Add ⅓ of your cream and loosely spread it over cake pieces. Add ½ of the sliced strawberries. Repeat with remaining ingredients (adding ½ of the blueberries for the second fruit layer). Frost the top with last ⅓ of cream and decorate with remaining fruit. 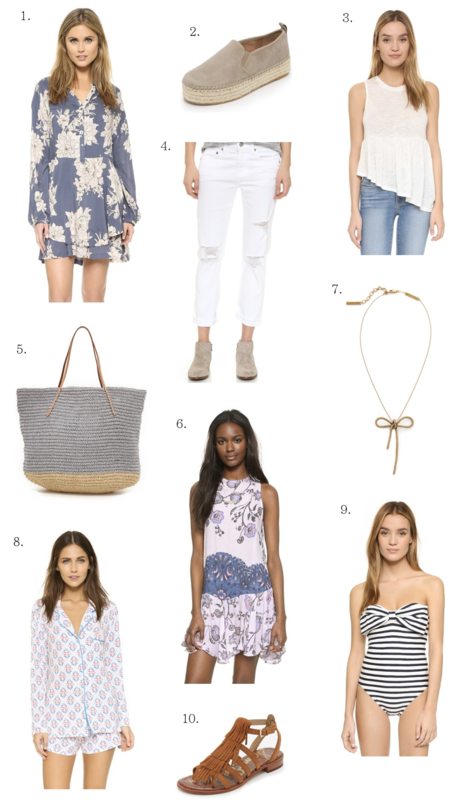 Have you guys checked out the ShopBop sale? Through tomorrow they are offering 25% off your order with code: INTHEFAM (some exclusions apply). 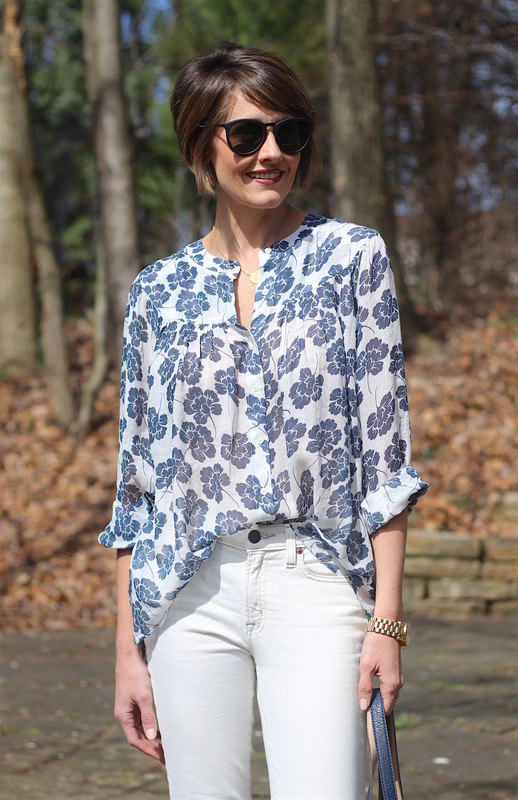 There are so many good finds on there but I’ve narrowed down some of my favorites here. 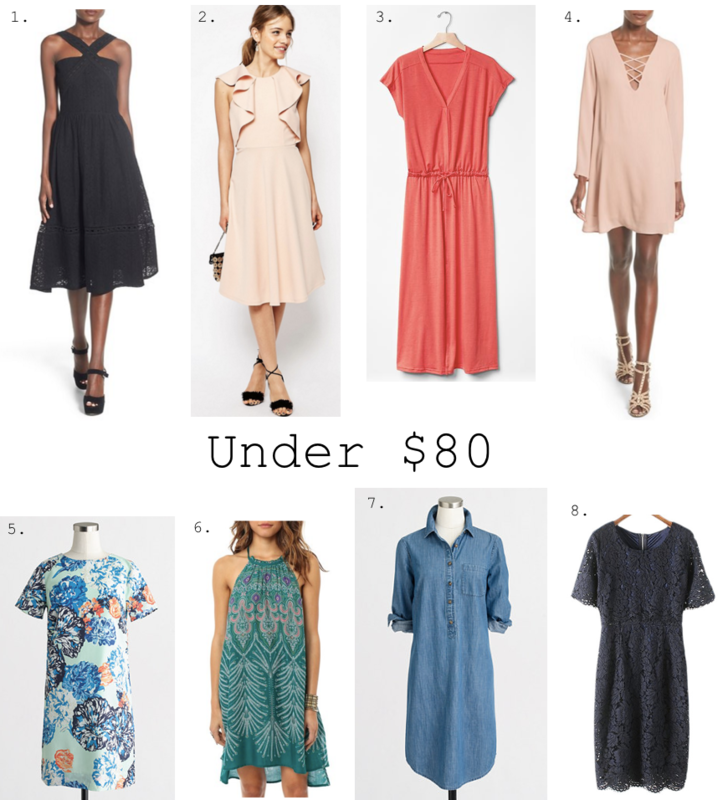 Some pretty and practical pieces for spring and summer. Anything in particular catch your eye?